Common Dance Injuries. Explanation and Treatment. There are common dance injuries that are recognized in a general way, but it is good to keep in mind that the type of dance you practice might determine its main risks. For example, female ballet dancers are likely to suffer from ankle sprains (due to the high demand on foot work); African style dancers are more in risk of getting injuries around the neck or back (due to the strong dynamics of movements executed with the spine); urban dancers have their knees in higher risk (because of the attacked flexions and screw-type extensions they do with the legs). So, if you are a contemporary dancer, your risks will depend of the different techniques that make up your personal training or choreographic engagements. Still, common dance injuries will mainly be those of our musculoskeletal system, derived from the constant physical demand. 2. Muscle or ligament tear (or strain). 7. Overload (chronicle fatigue) syndromes. - There are generally two different phases: an acute phase, where swelling must be handled and healing up measures have to be taken; a rehabilitation phase, where physiotherapy determines an exercising program in order to recover functionality and complete body awareness (security, stability, force and elasticity). -During the acute phase, the so called R.I.C.E. principles apply for almost all cases (Rest, Ice, Compression and Elevation). Analgesic and anti-inflammatory medication is also helpful. -It is very important to find the cause or causes that created the situation, to avoid its repetition. Without this, there will always be the risk of a relapse or chronicle sicknesses. A spasm is a sustained and involuntary contraction that happens after a muscular effort that implies an overload. Symptoms: it appears as a decrease in the width of the mobility of surrounding joints, pain (spontaneous and when touching the muscle) and severe decrease of the efficiency of the muscular group that is affected. It can be the preliminary situation of a muscular tear. -Rest and regulation of the activity that produced the spasm. -Use of physical, local means: wet heat, deep heat (ultrasound or short waves), professional massage (with use of oils or lubricants), soft mechanical stretching. -Use of analgesic and anti-inflammatory medication. (It is said that the best way of relaxing muscles is to take painkillers. This is because there is a circular behavior in spasms, which makes a contraction to cause pain and then the pain to cause more contraction. So, by eliminating the pain, one can break that circle and release the muscular fibers). -Restart physical activity gradually and carefully to avoid a relapse. Acute muscle strain. Image in "Handbook for the orthopaedic assistant". Schneider, F.R.. Mosby, 1972. A muscle tear is the loss of continuity between muscular fibers. It is the consequence of a trauma or of efforts that imply overload. There are two different types of tears: longitudinal and transversal. 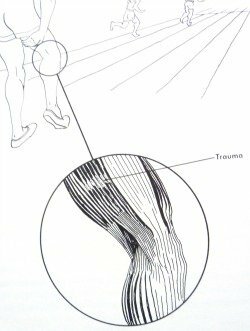 The longitudinal tear (also known as tear of sport), happens when muscular fibers split apart and leave a breach that can produce scarf tissue. When treated improperly, that new tissue causes a decrease in the efficiency of the muscle as well as possible repetitions or worsening of the injury in the same area. The transversal tear (also known as degenerative tear), happens when muscular fibers rift, loosing contact between them. This happens more frequently in the attachment between the muscle and the tendon in which it ends. Symptoms: local pain, functional loss of the affected muscular group, swelling, local hemorrhage. -It is good to use diagnostic methods like an ultrasound scan or magnetic resonance to delimitate the anatomical damage. This is especially important in the case of transversal tears, because those might need chirurgical repair. -Avoid overloading efforts or repetition of the exercises that caused the damage. -Apply physical means to diminish inflammation: ice, careful compressive dressings. -Allow a healing period before restarting the physical activity (it can last up to five weeks). -Reestablish the elasticity of the muscular group or ligament. -Strengthen the zone in order to recover efficiency, security and full body awareness. A tendonitis is the swelling of a tendon structure, as a consequence of major traumas or repeated minor traumas. Symptoms: local swelling, pain and loss of functional capability. -Avoid any activity that can continue causing local damage or irritation. -Careful rest, according to the severity of the swelling (because in the majority of cases there’s no need to immobilize). -Use of physical means: heat and cold, together with successive stretching and strengthening (they are both necessary and are done since the beginning of the treatment). -Local infiltrations with steroid anti-inflammatory medication (which has a local effect). A sprain is the partial rift of ligaments (fibers of the connective tissue) that give support and stability to the joints. They are a consequence of traumas generated by forces that produce displacements that go beyond the physiological limits and can affect the stability of the joint. Sprains are classified in groups (3 degrees), depending on the severity of the swelling, but mostly according to the augmented and abnormal mobility they produce on the joint. The most common ones are ankle and knee sprains. Symptoms: acute immediate pain after the trauma, fast local swelling, severe functional loss of the affected joint. -Soft compressive dressings (‘Robert Jones’ compressive dressings, without elastic). -Possibility of rigid immobilization of the joint. The time will depend on the pain, swelling degree and alteration of stability of the joint. -Depending on the youth of the person or like in the case of dancers (whose profession is physically engaged) chirurgical repair might be needed. In all cases, a rehabilitation program will be needed in order to recover complete body awareness and functionality. Follow this link to read a related article about the specific case of an ankle sprain. A dislocation is a partial or total loss of the physical coherence between two surfaces of a joint that should remain together. It is produced by an external force that causes the rift of several structures that support the joint (capsular ligament). Symptoms: a grotesque deformity of the joint happens as a consequence of the trauma, severe pain, total functional disability and alteration of general vital signs. A dislocation implies an imminent possibility of arterial and peripheral nerves damage (due to the displacement). It is considered as a real orthopedic emergency. It is very important that friends or people that are in the place of the event do not try to move or fix the affected joint. The person should be taken immediately and as far as possible to a medical center. -Check if there are no fractures associated to the dislocation.-Mechanical or chirurgical reestablishment of the joint’s placement. -Functional recovery of the affected zone with physiotherapy, (stretching, strengthening and recovery of body awareness). A fracture is the partial or total loss of continuity of an osseous structure (a bone). It is generally produced by direct or indirect traumas but can also be caused by sicknesses or practices that weaken the osseous structure. Some fractures are not caused by major traumas but by repetitive minor traumas. They are called stress fractures and are common among sportive people. Symptoms: deformity, severe pain, swelling, functional loss and hemorrhage. A fracture is considered as an orthopedic urgency. Whenever there’s a suspicion of fracture, the area must be completely immobilized. The person should be taken immediately to a medical center, where doctors will check the diagnosis with x-rays. -The fracture might need internal immobilization (by surgery) or external immobilization (plasters or splints). 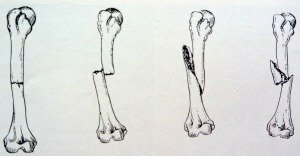 The period will last until it is considered clinically and by radiological means that the fracture is healed up (there is a lapse of time recognized but it is different for each bone). 7. Overload syndromes (also known as chronicle fatigue). The overload syndromes are local or general swelling manifestations produced by repetition, forced training or inadequate technique over muscular or ligament structures. Apparently they do not create damages but they produce pain and diminish physical capabilities. They are also a preliminary situation of degenerative injuries (any of the others above). Symptoms: pain, intensification of muscular tone, loss of elasticity, loss of the capacity of recovery after an effort and functional decrease. -Particularly in the case of physically engaged people, it is necessary to make an evaluation of the working load and ways. The goal is to detect the facts that led to the overload syndrome and then correct them. -Start a progressive physical therapy. The aim is to strengthen for the load that led to the overload in such a way that the work becomes an easy task and the overload disappears. -Start occupational therapy (specialists will analyze the causes of the situation and will apply corrective measurements. Vascular syndromes are less frequent and do not make part of the musculoskeletal system injuries. Still, they can be caused by demanding physical activity as they can be a consequence of direct major traumas or repetitive minor traumas (like efforts or training). The vascular structures (arteries, veins and lymphatic vessels) can swell and even get obstructed. This produces local swelling symptoms that are sometimes severe, as well as all the consequences that derivate from the obstruction of the blood or lymphatic flow. Symptoms: local swelling, pain, ischemia (local, regional or total circulatory decrease in an extremity), venous congestion and diffuse swelling. -It is important to make an early diagnosis because vascular syndromes can evolve into serious illnesses, even though the cause is not always severe. Whenever there’s a suspicion of a vascular syndrome, it is very important to visit the doctor immediately. -The doctor will decide if treating only with rest and anti-inflammatory medication or if it is necessary to make a medicated anticoagulation process or a catheterization (procedure of vascular cleansing). Common dance injuries can be treated. Having one of those situations does not necessarily mean that the dancer’s career comes to an end. Though, keep in mind that all injuries leave after-effects almost for the rest of life, which will be a constant bother and risk during the physical activity. Ideally, dancers should avoid injuries completely. This could only be possible if every one of them keeps a careful observation of her/his own health conditions, under medical advice if necessary. The best thing is that preventive measures are taken very seriously, according to the specific physiological needs of every dancer. If an injury still occurs, a serious and careful treatment must be followed, in order to diminish damages and potential future relapses. This content is of high quality but is provided for general information only. It should not be treated as a substitute for the medical advice of your own doctor or any other health care professional. contemporary-dance.org is not responsible or liable for any diagnosis made by a user based on the content of this page. Always consult your own doctor if you're in any way concerned about your health. 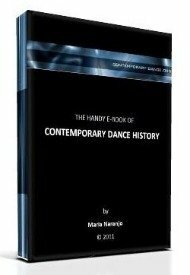 Common dance injuries was written under the direction of Doctor Juan Guillermo Naranjo, Orthopedic Surgeon, professional card number 01 2882/1973.